There are about a million different resources and writing worksheets outside in the world for writers and authors but tbh going outside is scary and who wants to do that? To make things less scary I've collected together every worksheet I know of in one place for you to browse so we can really settle down and feel cosy. I'm doing this to procrastinate from Nanowrimo so shhh don't tell anyone. Plot is the very lifeblood of your story! It's so important and yet sometimes it will allude you! Don't worry! There are so many great resources out there. Try a worksheet and see if it helps. 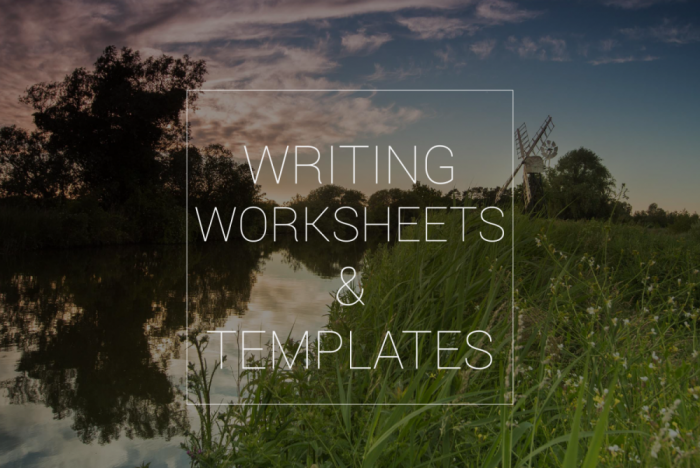 I find it best to browse through resources until something sticks because not all worksheets are ideal for all writers. This an old resource (1998) but it's still great! If you can get over the old(ish) design of the page (like, we're talking twenty year old web design here) it's a real treat to work through and fast! Sometimes you just want to do things quickly. So if you're three packets deep into a haribo frenzy or ten cups of tea too far down a caffeinated haze it's possible this is the worksheet for you! Also the entire page is in this cute lavender shade and I think it's wonderful. You're wondering it. I'm wondering it. Perhaps we've always been wondering it since the dawn of time: How Exactly Do I End this Flipping Novel? Luckily our pal Sara also has the answer with this great little list. She also has a tonne of great writing worksheets here. If you use Evernote to write notes (or maybe your whole novel!) this might be perfect for you. No, it's not some young artist jamming to some sweet beats. No that's not what I thought it was also when I heard about it. Martha is an international plot consultant, and author of the Plot Whisperer books for writers. She has so so so many great resources on her website but I really like this one. For people who have Scrivener this template is fantastic! It's free too although if you particularly like it consider helping Ksenia out on patreon! Templates like these are absolute gems! I love being able to store all my info in one place! If you like the idea of a Scrivener template but this one doesn't suit you try this one instead, or even this one. Planning a compelling storyline can be hard, luckily Katja has us covered! Sometimes characters walk into your head on a rainy afternoon in November and never leave, others avoid you altogether when they feel like it. If you're having trouble fleshing out characters or want structure for the voice talking inside your head this is the ideal list of writing worksheets for you! Take a look at the things I've found on my travels through the interwebs. This character chart template is super helpful! The more you fill out the chart the stronger your characters will be! This resource is completely free but you can always donate to Annie via paypal if you fall in love with it. I especially love the detail in this chart. Quirks are interesting to work out in a character because it can make them seem so real! The writers digest is a great place to hang out in general for tips and hints on all kinds of things! This is a particular fave of mine. If you're feeling particularly stressed or confused you can always count on Writer's Digest to help you out. Honestly? I'm feeling a little exhausted at this point. There are so many resources! Bah!! Who's idea was it to collect writing worksheets all in one convenient place?? Mine? Well, obvs, I'm an idiot. Anyway! Here's another one I like. We've come too far to stop now. I can't count the number of times over the years that Elizabeth has kept me going so in order to keep me going through this list let's highlight Elizabeth! She made a great list of character sheets you can download below. Legit might be dying of exhaustion but my dying wish is that you look at this great worksheet on how to make awesome characters. When I first came across this I was so excited! But now my hands are sweaty and my mouth is dry because I've been making this list for so long I'm beginning to think I'll never find my way out of the labyrinth. Anyway, here's Bryn Donovan on how to facial expressions when you know you're leaning on your crutch expression and need something new. Okay, so this stuff is for those of you who want to get down to business and are ready to commit. I'm feeling a second-wind come over me so here are some of my face long resources! That's right. 170 pages of fabulousness! STUNNING. Fae runs the #storycrafter writing Twitter chat every Sunday (I happen to miss this every Sunday because I'm a fool and keep forgetting and getting confused by time zones) if you're also interested in talking to like-minded people but beyond that just look at this workbook!!! As a part-time designer and full time I appreciate the amount of effort that's gone into making this book of writing worksheets and I just feel all kinds of giddy ! The workbook is only $9 so it's not going to necessarily break the bank and can be something you save for if you don't have the money right now. I mean, you couldn't make this stuff up. This is $10. Well worth the money if you have it spare and are looking for a resource. At $2.99 (currently half price I think), this is a steal! Michelle is a NYT bestseller and spends a lot of time helping out other writers and authors. She has twenty years of experience behind her and tbh one day when I am flush with cash and not eating three day old pizza and sewing up holes in my shoes I'd love to have her as a coach too. I honestly didn't think we'd make it to this point together but this section is reserved for YOU. Tell me what links you have out there that are worth mentioning!! I wanted to add more links but to be honest it was stop here or die from exhaustion so once I get back from my quick nap pls tell me where you've found good things on the internet! No link is too small! When I'm back from my nap I'll even add them into this post!